A police officer on Sunday stands at the scene of a weekend acid attack. Hong Kong, China (CNN) -- The acid thrower who has terrorized Hong Kong over the last year remained at large Monday after a man arrested in connection with an attack at a popular tourist spot was ruled out as a suspect. 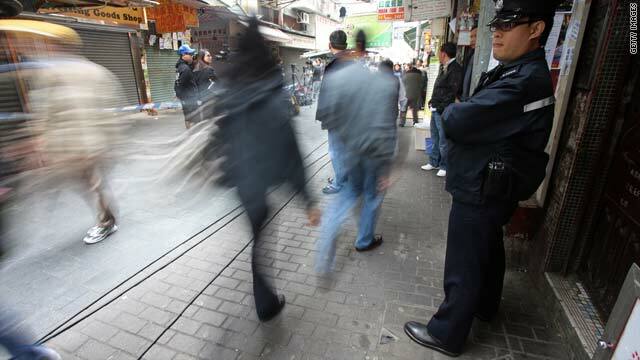 About 30 people, including some children, were injured in Saturday's attack when two bottles of acid were thrown at shoppers on Temple Street, a busy outdoor market that is a favorite of tourists and locals. Police said a man arrested over the incident had no involvement in the attack, but he was later charged with deception in another case. He will appear in court Monday on that charge, a police spokesman said. No details were immediately available on the other case. Over the last year, shoppers have been victims of acid attacks on at least four previous occasions, leaving many people injured. Most attacks have taken place in the busy shopping district of Mong Kok, which is close to the scene of Saturday's incident. Most incidents involved someone tossing a bottle of corrosive acid from a rooftop and targeting shoppers. Police are now back at square one in the case. They have no idea who the acid attacker is: whether it is one person or more, and what the motive might be. They do know however that the attacker is able to leave the scene of the attacks easily amid the crowds. Authorities in Hong Kong have set up a 24-hour hotline for information on the incidents and the government has installed a surveillance camera system in the area of the attacks, worth 1.7 million Hong Kong dollars ($219,000). CNN's Roya Shadravan and Anna Luk in Hong Kong contributed to this report.